Scunthorpe dominated the forward battle but Wharfedale’s backs managed a rousing finish to grab two valuable points. Scunthorpe probably desired to win but Dale at last came to life in the last 10 minutes and a tired Scunthorpe side were overjoyed to hear the final whistle. 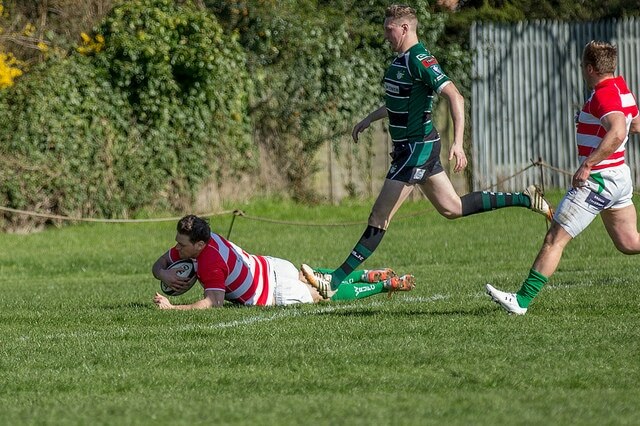 Another away game was lost by a point but this was different to Hinckley and South Leicester as it was a late Dale surge that led to four tries and closed the gap. Wharfedale gave away far too many scrum penalties to be able to compete and also had a poor afternoon in the line out. The tackling was also weak at times and there were handling errors that stopped progress. The contest started well for Dale. Scunthorpe went through seven phases before spilling the ball. Shaky ball from the scrum was used well. Harry Bullough joined the line and an inside ball found James Tincknell. Strong running saw Tincknell finishing off the sweeping move. Tom Barrett added the conversion. Dale could now eat into the fragile confidence of struggling Scunthorpe. Instead they gifted Scunthorpe the restart and then watched helplessly as, second row David Garbutt, took an inside ball and ran to the line. The next twenty five minutes were dominated by the Scunthorpe pack. Oliver Cole crashed over and a penalty try was awarded. Adam Middleton’s two conversions stretched Scunthorpe’s lead to 19-7. Scunthorpe could have had more points but when they did try to spread the ball the handling was poor. Starved of possession Wharfedale found it hard to utilise their flying backs. In the last play of the first half however another excellent handling move created space for Josh Prell to score. Barrett went close with the difficult conversion but at least the visitors were back in touch. The move came from a scrum penalty to Wharfedale (a unique occasion). Stand in scrum half, Scott Jordan, ran the ball and his break was followed up. Forwards and backs combined to set up the try. The second half was a similar affair. Slow but effective work from Scunthorpe grinding forward and then moments of elan when Dale had the ball. The Green machine again started well and soon had an attacking 5 metre line out. The set piece went wrong but a minute later Dale were again charging to the try line. This time the scoring pass was not taken and Scunthorpe were let off. A Jake Barron try and a Middleton penalty seemed to have put the game beyond the reach of a lacklustre Wharfedale and only the most faithful could see Dale getting anything out of the game. At last Dale woke up and brought something of a smile to the large group of travelling supporters. Forwards and backs combined in an exhilarating move that saw George Hedgley touch down. Barrett slotted the extras before being on the end of another dashing move for the bonus point try and his conversion closed the gap to one point. Two bonus points were an amazing reward that seemed unlikely with 10 minutes to go. Not all was rotten in the county of Lincolnshire. James Tincknell was strong in defence and attack; Harry Bullough, Josh Prell and Tom Davidson made good inroads and with Jamie Guy tackled well. Scott Jordan had to step in as scrum half after 12 minutes and had a good game often showing that he had watched and learnt from Phil Woodhead. Tom Barrett, despite a couple of mistakes, got the line moving well and was often a danger when running with the ball. Jordon Poole also made an impact when brought on in the second half. Man of the Match should have been Adam Howard who worked tirelessly all afternoon and played blind side and open side flaker, No 8, loose head and tight head!! It was also good to see Simon Borrill and Chris Swainson get good game time with Wharfedale 1sts. Photographs are available under the Photos tab – follow the Link to Flikr Album.